As US and European housing markets slow, investors are looking further afield. The Middle East's housing markets have been rapidly opening - and both opportunities and dangers await property investors, according to a report released today by the Global Property Guide. Buy-to-let investors, particularly, should consider the Middle East. Dubai, the richest and most progressive emirate of the United Arab Emirates (UAE), started it all. In 2002, Dubai announced that foreigners of any nationality would be able to own freehold residential titles, instead of the originally-proposed leasehold titles. Soon other countries in the Persian Gulf followed suit, including Bahrain, Qatar and Oman. Some investors still shy away because of the perceived political and security risks. However, good rewards await those willing to do their homework and explore the market. Since the Gulf's "for foreigners" market is still at its infancy, most properties sold to foreigners are off-plan. This has advantages and disadvantages. One advantage is that the buyer saves on the real estate agent's fee and legal fees, and the developer takes care of the property transfer procedure. In most cases, the developer also takes care of all maintenance and utilities like water, telephone and electricity connection. Because of their early stage of economic development, many Middle Eastern markets' property is still undervalued, leaving room for capital growth. Property prices are highest in central Tel Aviv at around US$5,000 per sq. m., followed by Dubai at around US$4,000 per sq. m.
Properties in central Cairo, Egypt are quite cheap from a foreigner's point of view; prices range from US$400 to US$1,400 per sq. m.
Property prices in central areas of the major or secondary city in Jordan, Morocco and Lebanon range from US$1,300 to US$1,900 per sq. m.
Similar properties in Southern Europe would be two to three times more expensive. For instance, apartments in Barcelona, Spain cost around US$7,000 per sq. 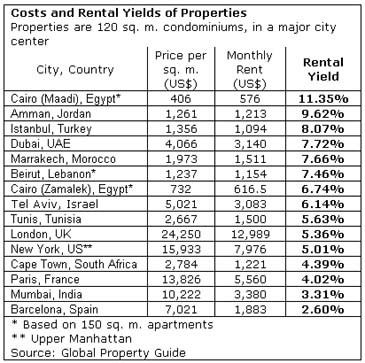 m.
Rental yields in the Middle East are quite high. For instance, yields in Cairo's Maadi district are typically in double digits, with earnings of up to 17% achievable on 250 sq. m. apartments. The tax environment is also extremely accommodating. In Amman, Jordan, rental yields of around 9.6% can be earned on 120 sq. m. units. In Dubai, rental yields can reach up to 10.2% for 50 sq. m. units (with only a 5% tax levied on rental value); in Marrakech, Morocco returns are up to 8.86% for 60 sq. m. units. By comparison, rental yields in Europe have fallen to relatively low levels, due to over a decade of rapid price increases. Properties in Central Paris earn yields of no more than 4.4%. In Spain, gross rental yields are between 2% and 4% only, barely covering costs. Investors will find that housing transaction costs are generally low to moderate in the Middle East. The roundtrip transaction cost, i.e. the total cost of buying and re-selling a residential property, is highest in Jordan at around 15% of the property's value. On the other hand, transaction costs are lowest in Dubai (at only 3.03%) and Bahrain (at 5%). Roundtrip costs in Lebanon, Israel and Tunisia are around 10%. In Egypt, costs are at 11.7%. 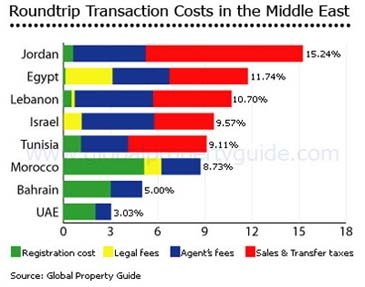 Real estate brokerage fees are lowest in Dubai (1%), Bahrain (2%), and Morocco (2.5%). In Lebanon, the agent's fee is typically 5%, split evenly between buyer and seller. In Jordan, the fee is 4%, plus 16% GST. In Israel the agent's fee is 4%, plus 15.5% GST.